Pemaquid Point Light is one of Maine’s most popular and photographed lighthouses whose breathtaking beauty isn’t confined solely to the historic site. Visitors also find the rock and ledge formations out in front of the lighthouse, as well as the restless sea that often presses up against the ledge in dramatic fashion, fascinating to behold. At the lighthouse, visitors are treated to a number of interesting educational exhibits inside the tower’s vestibule area where volunteers provide a brief history and some neat coastal related tidbits. 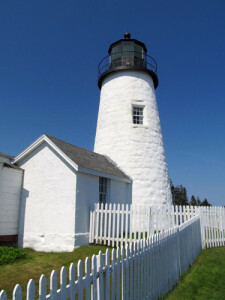 Once inside the lighthouse, visitors ascend the spiral staircase of the 38-foot beacon where they are treated to the wonderful sight of a working fourth order Fresnel lens at the top of their journey, which includes a superb vantage point of the unique coastline below. Pemaquid Point Light is also the first lighthouse in the nation that holds the distinction of its likeness depicted on American currency (the Maine State quarter). Volunteers from ALF’s Friends of Pemaquid Point Lighthouse chapter open the tower at Pemaquid Point Light Station daily from Memorial Day to Columbus Day. There is no charge to climb the tower, but donations are appreciated and help fund the ongoing care of this historic lighthouse. Children must be 42 inches tall to climb the lighthouse tower, and adults are not permitted to carry children up the stairs. Flat shoes (not sandals or flip-flops) are strongly recommended to climb the ladder into the lantern room. Please note: For safety reasons, the tower may be closed for climbing on rainy days.